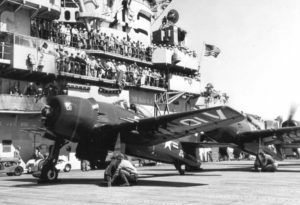 On the night of December 7, 1944, a flight of six F6F-5 Hellcat Aircraft took off from the Quonset Point Naval Air Station to practice night carrier landings on Quonset’s runways. After takeoff, Quonset tower instructed the aircraft to orbit the field two miles outside the designated landing circle to allow an incoming flight of airplanes to land. After that incoming flight was on the ground, Quonset tower gave clearance for the six Hellcats to begin their practice landings, but when the aircraft circled the field it was noticed that there were now only five airplanes instead of six. After ordering all five to land, an accounting was made, and it was discovered that one Hellcat, (Bu. No. 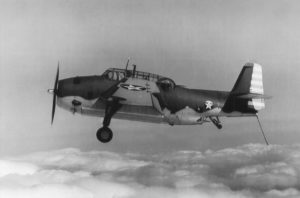 71036), piloted by Ensign Patrick Aloysius Hackett, age 22, was missing. Shortly afterward another pilot reported seeing a fire in a wooded area of North Kingstown. State police found the wreckage of Ensign Hackett’s plane on Stooke Hill to the north of Route 138. There had been no witnesses to the crash, and investigators speculated that the cause may have been due to engine failure. Ensign Hackett is buried in Philadelphia National Cemetery in Philadelphia, PA.
On the afternoon of Saturday, April 22, 1944, two F6F-3 Hellcats assigned to VF-7 at Quonset Point Naval Air Station, collided in mid-air over the Quonset Manor neighborhood of North Kingstown. Both pilots were killed. One plane sheared the tail off the other while both planes were several hundred feet in the air. 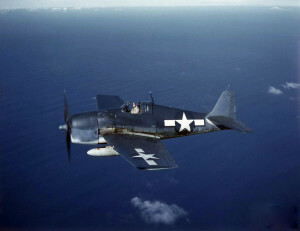 One of the Hellcats, (Bu. No. 42706), piloted by Ensign Joseph Clyde Rust, 22, of Alliance, Nebraska, crashed on King Phillip Drive and exploded. The other Hellcat, (Bu. No. 41965), piloted by Ensign Oswald Eugene Asplundh Jr., 21, of Glenview, Illinois, crashed and burned to the waterline in Sawmill Pond. Update: The accident occurred while a flight of three Hellcats was flying in a Vee formation at 4,000 feet. The flight leader, flying at the point of the Vee, suddenly began to pull away from the formation, and Ensigns Rust and Asplundh attempted to follow, and that’s when the collision occurred.